Servicemen at a Voronezh early warning radar in Pionersky, Kaliningrad Region. During the Cold War, fear of mutual destruction compelled the twin superpowers of the age to build up immense nuclear arsenals in the belief that only a guaranteed and devastating response could keep the other from attacking. Despite the complex evolution of geopolitics since then, the long-range radar capacities developed by the U.S. and USSR still play a strategic role today. Russia’s early warning radar system enables the country’s military to monitor activity across most of the northern hemisphere. There are four ultra-modern early warning radar stations of the "Voronezh" type in operation in Russia today. Three of these facilities are located in the European part of the country. In 2009, the radar station in the Leningrad Region came online, allowing tracking from Norway down as far south as Algeria. Eventually its range will also encompass the eastern seaboard of the United States. In 2011, a station also began working in the Kaliningrad Region in western Russia, providing surveillance across the whole of Europe. The third station, located in Russia's southern Krasnodar Region, covers the space over North Africa and the Middle East. A fourth long-range radar station in Siberia covers Central and East Asia, supported by several other Russian installations on the territory of some former Soviet republics. All of the facilities have the same task: to observe every man-made object that takes to the air at a distance of thousands of kilometers. During the Cold War this capacity was primarily intended for intercontinental ballistic missiles, which when pinpointed in the early stages of their flight would draw a retaliatory strike. The radar installations were also used to guide Soviet missiles. Today this role carries equal importance in view of the increasing global missile proliferation. Russian radar stations are being deployed according to emerging threats in the Middle East, as well as due to the missile defense system being developed by the United States. In the near future, radar will be used to create an effectively unbroken shield over Russia. The rapid commissioning of eight modern stations is now scheduled, some of which will replace old Soviet designs, while others are completely new. These will completely cover the expanse over Siberia and over the Arctic region, as well as covering part of the sky over North America. The Voronezh system is the backbone of Russia's modern radar tracking capacity and is the fifth generation of radars, the first of which appeared immediately after World War II. Voronezh consists of several modules that make the stations compact and mobile. At its core is a large antenna array, which performs the basic task of monitoring the target territory. Its operation is ensured by several modules full of equipment, and personnel working in special portable premises. Providing there is a solid concrete base, the radar can be deployed and set up in a very short time, assisted also by its low power consumption. Voronezh has a number of advantages when compared with older systems and its foreign counterparts. Its coverage area is 4,000 miles and its height sensing exceeds 2,500 miles, which allows monitoring not only of the Earth's atmosphere, but also space. The angle of observation is close to horizontal, which leaves virtually no dead zones that are inaccessible to its radio waves. 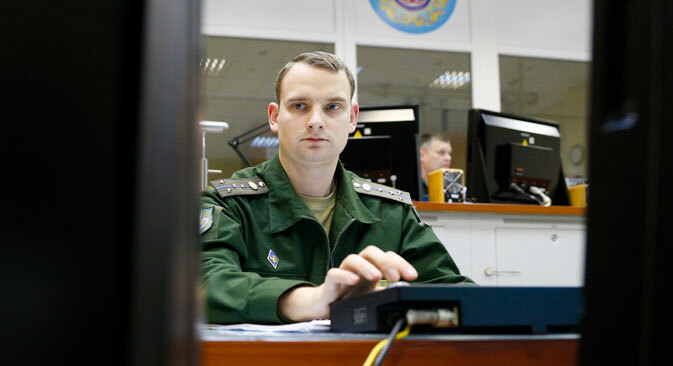 This achievement can be attributed to the long experience of the system's designers at the Radio Engineering and Information Systems enterprise, which includes the Mintz Radio Engineering Institute, the same company that created the Soviet radar infrastructure. But for all of the technical prowess, only a small amount of this technology is allowed for export. Expertise and capacity for tracking the atmosphere and near space are a key element in national security and are classified accordingly.